The fear of failure holds us back from truly living. We want to look good in the eyes of others, to be accepted. We want to do well, to feel competent, smart and good. We all have a fear of failure, and tend to avoid things that have a higher likelihood of failure. That’s the reason we have trouble with even small changes – because we know that failure is likely – at least until we figure it all out – and who knows how long that will take! That’s a lot of failure to endure, for a non-guaranteed gain. We use these phrases to convince ourselves and others that we don’t need to go through the process. These are lies. We haven’t been through the process. We’re trying to avoid the process. The great news is that there are some easy tricks to overcome this kind of thinking. Once you’re aware of this tendency, you can catch it and short-circuit the distorted thinking. You might actually find it hard to think about this question, because just thinking about failing has you downplaying your own desires. Push through it anyway. What if failing didn’t matter? What if it really didn’t matter at all? What would you try this year? Write a book? Start a business? Quit your job? Speak your mind? Move? Attend an event? Start an organization? Try a new sport/exercise? Do things completely differently? The only person who cares about you failing is you. If you don’t believe that, you’re still operating with layers of others’ perceived expectations weighing down your thinking. What if I fail – how will I recover? Chances are, even if you fail, it’s very easy to recover. Mistakes are allowed in life, even big mistakes. Small mistakes are almost expected (except internally for some reason). The most important thing to focus on is how the failure helps. Failures that you correct, recover and learn from are not steps backward, they are part of the process of moving forward. Often times this is the real danger. It feels safer to stay where you are, but it’s not. Growth is required to live. 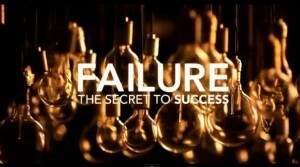 Staying cemented in thought and action for the purpose of avoiding failure is in fact the bigger mistake. Failing to act in the face of changing circumstances (in other words, life) is almost always the wrong answer, with much larger consequences in the long term. Whoa. You never ask yourself this, do you? Now’s the time to start. Don’t confuse this with self-deception or head-in-the-clouds wishful thinking. Look at how life works, and look at your life specifically. Most things in life work amazingly well 99% of the time. So, focus on what happens when you succeed – instead of what happens if you fail. This shift in thought alone can change your whole life. Wait, things can go right in a failure? Yep. In fact, most of the time the vast majority of things went swimmingly. You have simply chosen to focus on the one, or few, things that might not have gone as well. What’s more, even the importance of the event itself gets blown out of proportion when there’s failure involved. That’s how you end up thinking that one ill-timed comment, burned dish, failed strategy, or poor meeting trumps the thousands that went without a hitch. That’s extreme distortion, not reality. You remember it more only because you continue to focus on it, not because it’s inherently more significant. If others dwell on your failure, you probably gave them permission by focusing on it too much yourself. Anyone that makes a big deal of your error(s) is simply revealing their own heightened fear of failure. That’s their issue – no need to make it yours. Fear of failure is one of the most crippling diseases we give ourselves. It results in lack of growth, lack of change, and lack of experience. And after all, what’s the point of life if not growth, change, and experience? Success in life (whatever that may mean to you) is about embracing failure. The most successful people know this is true, having long surpassed the basic skills of ‘accepting’ failure, and instead almost seeking out ways to fail – using it as a tool for getting them where they want to go in life.